How do you measure the value of your technology investments? Most organizations have well-established tracking measures to quantify the activity levels of technical support operations, like help desks and PC support. But what about audiovisual gear? Are the same measures applied to things like videoconference usage, or video projector purchases? 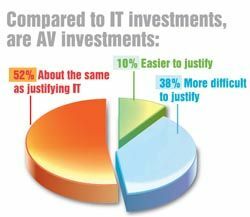 AV Technology and AV-1.org conducted a poll to assess what kinds of metrics were being used to evaluate AV operations and technology investments. AV-1 is a peer-to-peer support network, whose members are inhouse planners, designers, procurement specialists, installers, and support personnel who provide services associated with technology-enhanced facilities and presentation systems owned by their employer. What we found is that less than half of IT/AV managers are using any metrics at all to measure AV investment return. In some cases, they are beginning to use measures similar to those used to evaluate IT investments. In AV or IT, there is little direct revenue-generating potential, unless you're considering "renting" your videoconferencing facility. Usually, AV and IT investments and operations are required to prove ROI in terms of cost-savings - which is always more difficult and, sometimes, even subjective. gains and cost savings offered by their AV investments. The challenge, however, is in tying those benefits into new revenue. In fact, only 9 percent of our interview respondents said that actual ROI was used as a means to measure the value of AV investments. Still, information technology has the edge on AV gear when it comes to justifying ROI. Help desk operations and job-ticket tracking systems have become the norm for tracking and justifying the investment in IT operations and equipment. But has this translated to audiovisual communications and presentation? According to two-thirds of respondents, it has. And that's good news, since troubleshooting AV system issues generally requires a different skill set than IT-related matters. The most commonly used methods used to evaluate AV operations tend to be subjective measure - client satisfaction surveys top the list, with 63 percent of respondents citing this approach. Over one-half of our respondents cited various quantitative measures, such as "total number of service/help desk calls." This type of measure can certainly support the need for AV operations, but it falls short of making the stronger case for actual return or savings from AV activities. How could an organization make the case for actual ROI? For businesses, it can be a simple matter of demonstrating travel cost savings. For example, if the average cost of a domestic business trip is $1,110 (accord- ing to Trade Show Executive magazine), it may only take 36 business trips to pay back the cost of a $40,000 HD videoconferencing system. Depending on company size, that can be a fast payback period. In a university setting, it may be more difficult to link AV investments with ROI, but few would disagree that AV systems have become integral teaching tools in the classrooms and lecture halls. In fact, the internet itself was born out of the need for informational collaboration - which is the essence of education and learning. AV systems provide the "endpoints" that make collaboration possible, and determines the "quality" level of the images and sound. Using measures like these and tracking improvement trends in these areas will go a long way in establishing and proving the ROI of AV equipment investments and operations.